The prices in this deal round up were accurate as of 2019-03-30 10:32 EST. The prices may have changed since then. 68% OFF Gaiam Restore Pilates bar Kit: You can get this for only $10.99 here and it’s normally $34.98 at Amazon. 57% OFF Martha Stewart Essentials 30-Piece Cutlery Set, Created for Macy’s: You can get this for only $29.99 here and it’s normally $70.00 at Macys. 69% OFF MOEN Transitional Soap Dispenser in Chrome: You can get this for only $31.09 here and it’s normally $103.62 at Home Depot. 70% OFF BigMouth Inc. “i’m kinda a big dill” mug: You can get this for only $7.20 here and it’s normally $24.00 at Kohls. 62% OFF Insignia – 2.0-Channel Soundbar with Digital Amplifier – Black: You can get this for only $29.99 here and it’s normally $79.99 at Best Buy. 64% OFF Fujifilm Instax Square SQ10 Hybrid Instant Camera – Black: You can get this for only $99.99 here and it’s normally $279.00 at Amazon. 54% OFF Thermos Intak 24 Ounce Hydration Bottle with Meter, Green: You can get this for only $6.79 here and it’s normally $14.99 at Amazon. 43% OFF Eddie Bauer Mountain Plaid Duvet Cover Set Full/Queen Scarlet: You can get this for only $45.99 here and it’s normally $81.54 at Amazon. 73% OFF ZAGG – InvisibleShield Glass Luxe Screen Protector for Apple Watch Series 2 42mm – Rose Gold: You can get this for only $7.99 here and it’s normally $29.99 at Best Buy. 46% OFF NCAA Arkansas Razorbacks Economy Tailgate Tent: You can get this for only $106.54 here and it’s normally $199.95 at Amazon. 76% OFF JBL – GX Series 12″ Single-Voice-Coil 4-Ohm Subwoofer – Black: You can get this for only $29.99 here and it’s normally $129.99 at Best Buy. 45% OFF Linksys Velop Whole Home WiFi Intelligent Mesh System, 3-pack, 1 AC2200 Node and 2 AC1300 Wall Plug-in Nodes, Easy Setup, Maximize Wi-Fi Range & Speed: You can get this for only $219.99 here and it’s normally $399.99 at Amazon. 53% OFF Asmodee Nations: You can get this for only $46.31 here and it’s normally $99.99 at Amazon. 55% OFF KICKER – CX Series 300W Class D Mono Amplifier with Variable Low-Pass Crossover – Black: You can get this for only $67.49 here and it’s normally $149.99 at Best Buy. 55% OFF KICKER – CX Series 1200W Class D Mono Amplifier with Variable Low-Pass Crossover – Black: You can get this for only $157.49 here and it’s normally $349.99 at Best Buy. 82% OFF Nba 2K18 Standard Edition – PlayStation 4: You can get this for only $5.33 here and it’s normally $29.99 at Amazon. 51% OFF Greenzone Sleep Jersey Waterproof Bamboo Mattress Protector, King: You can get this for only $24.47 here and it’s normally $49.99 at Amazon. 49% OFF My Little Pony Star Students Doll: You can get this for only $6.50 here and it’s normally $12.99 at Amazon. 55% OFF Hot Wheels Chewbacca with PORG Vehicle: You can get this for only $7.13 here and it’s normally $16.03 at Amazon. 56% OFF Amerock BP853MB Anniversary Knob, Matte Black, 1-3/16-Inch Diameter: You can get this for only $5.90 here and it’s normally $13.46 at Amazon. 56% OFF Ben 10 Basic Action Figure: You can get this for only $10.22 here and it’s normally $23.73 at Amazon. 55% OFF Hillsdale Furniture 4621-826 Saddle, Rustic Gray Counter Stool: You can get this for only $57.83 here and it’s normally $129.00 at Amazon. 45% OFF Hoover REACT QuickLift Upright Vacuum Cleaner: You can get this for only $98.00 here and it’s normally $178.99 at Home Depot. 43% OFF Cuisinart Classic Stainless Steel Cookware Set (8-Piece): You can get this for only $89.99 here and it’s normally $159.99 at Amazon. 45% OFF Cooks Standard 6-Piece Stainless Steel Knife Set with Expandable Bamboo Block for Extra Slots: You can get this for only $29.47 here and it’s normally $53.85 at Amazon. 66% OFF Hasbro Game Night – Nintendo Switch: You can get this for only $19.99 here and it’s normally $59.99 at Best Buy. 81% OFF Insignia – TV Stand for Flat-Panel TVs Up to 60″ – Black: You can get this for only $39.99 here and it’s normally $219.99 at Best Buy. 86% OFF Mirabelle MIRSD1166ORB Metal Deck Mounted Soap Dispenser: You can get this for only $9.99 here and it’s normally $76.00 at Amazon. 53% OFF IRWIN VISE-GRIP GrooveLock V-Jaw Pliers, 8-Inch, 2078108: You can get this for only $9.98 here and it’s normally $21.26 at Amazon. 44% OFF Homgeek French Press Coffee Maker, Double Wall Stainless Steel French Press Heat Resistant Coffee Press with Extra Filters (1 Liter/34 Oz, Black): You can get this for only $27.99 here and it’s normally $49.99 at Amazon. 50% OFF Baby Bibs Bandana Bibs for Boys and Girls, Drool Bibs for Toddler Teething 8 Pack by YOOFOSS (Boys): You can get this for only $14.99 here and it’s normally $29.99 at Amazon. 46% OFF Sportsman Gasoline 2000W Portable Generator: You can get this for only $149.00 here and it’s normally $279.00 at Walmart. 67% OFF Mainstays Melamine Prep Bowl Set: You can get this for only $4.24 here and it’s normally $12.88 at Walmart. 72% OFF Q-SEE 1080P HD IP Bullet Security Camera 2 Pack: You can get this for only $49.99 here and it’s normally $179.99 at Walmart. 41% OFF Tzumi Wireless Charging Pad and Rechargeable Wireless Mouse – Built-in Wireless Charging Phone Stand for all Qi-Enabled Devices: You can get this for only $10.00 here and it’s normally $17.00 at Walmart. 67% OFF OUT! Oxygen Activated Pet Stain & Odor Remover, 32 oz: You can get this for only $3.98 here and it’s normally $12.37 at Walmart. 48% OFF Ratcheting Cargo Bar 40in.-70in. : You can get this for only $19.99 here and it’s normally $38.89 at Walmart. 76% OFF Calvin Klein Men’s Striped Sleeve Hooded Sweatshirt: You can get this for only $21.16 here and it’s normally $89.50 at Macys. 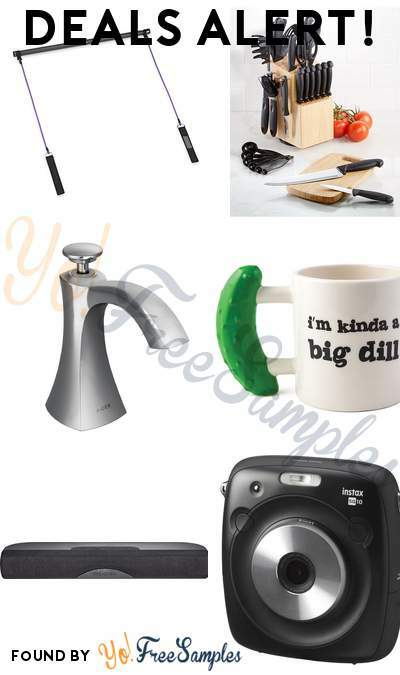 76% OFF INC International Concepts I.N.C. Men’s Sequin Graphic Hoodie, Created for Macy’s: You can get this for only $17.96 here and it’s normally $75.00 at Macys. 59% OFF Charter Club Water-Resistant Hooded Anorak Jacket, Created for Macy’s: You can get this for only $39.99 here and it’s normally $99.50 at Macys. 77% OFF Club Room Men’s Classic/Regular Fit Solid Dress Shirt, Created for Macy’s: You can get this for only $9.99 here and it’s normally $45.00 at Macys. 80% OFF Lauren Ralph Lauren Solid Ultraflex Classic-Fit Wool Jacket: You can get this for only $89.99 here and it’s normally $450.00 at Macys. 70% OFF Nike Little Boys Faux-Sherpa Full-Zip Hoodie: You can get this for only $14.96 here and it’s normally $50.00 at Macys. 60% OFF Smart Gear 1080p HD Recorder Dash Cam: You can get this for only $19.99 here and it’s normally $49.99 at Kohls. 60% OFF Disney’s Mickey Mouse Having A Ball Playland: You can get this for only $15.99 here and it’s normally $39.99 at Kohls. 80% OFF Toddler Boy Jumping Beans Space Dyed Microfleece Zip Lightweight Jacket: You can get this for only $3.60 here and it’s normally $18.00 at Kohls.